because of the score collection and entry issues. 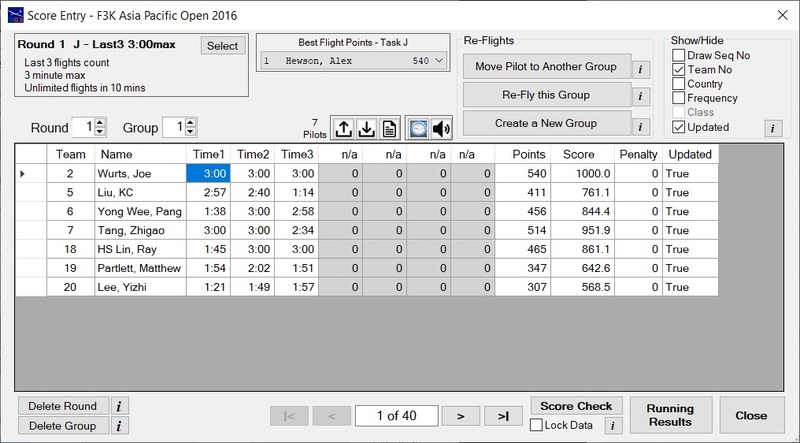 process of setting up, running and scoring F3K competitions is straightforward. Two new tasks (I and J) became official effective 1 January 2012.
the 2012 rules on their web site. but different dropped scores is correctly implemented in the Overall Results report. Creates an optimised draw that avoids frequency and/or team clashes. 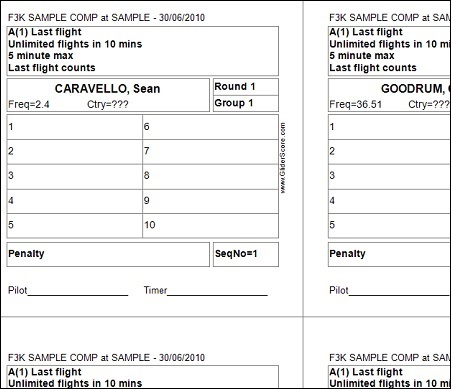 Tasks for each round can be selected as part of the process of printing Score Cards. according to the newly selected task rules. Enter actual flight times in the order flown. The program takes care of necessary adjustments (except Poker). One-click score entry for Task D. See below for details. A task 'O' (Other) is provided for non-FAI tasks. All times entered are simply added together. Pilots can be moved between groups, and even rounds, for re-flights. Deducts up to five drop scores at predetermined rounds flown. Expand F3K on the side menu to work through these features. Double-Click scoring for Task D (flight of 30 secs, then increasing by 15 secs). A pilot achieves all 7 flight times. A double-click in the Time7 column for that pilot enters all scores instantly. Double-click on any other column and the scores to that point will be entered and later scores adjusted to zero. For more details, look here. Watch the Comp Setup F3K video.